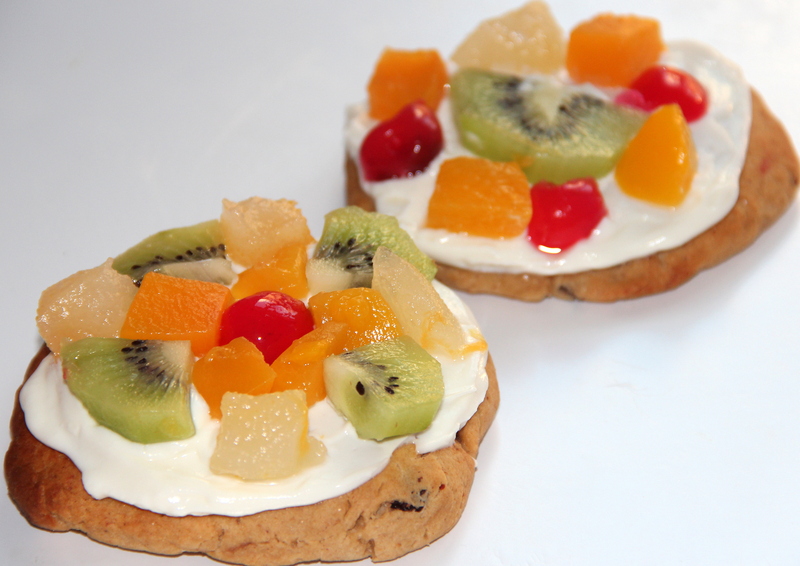 A healthier honey cookie spread with Greek yogurt topped with fruits. If you’ve been looking for a healthier cookie recipe to make for holiday, this is the best! They are awesome just on their own. But adding the yogurt and fruit makes them even better. The yogurt might sound odd, spreading on top of a cookie, but it adds creaminess and the fruit adds a little crunch. Honestly, this is probably one of my favourite snacks. You will love these! Pre-heat the oven at 180deg C, line the cookie tray/baking tray with parchment paper and set aside. In a small bowl combine flour, baking powder and salt mix well. Beat vegetable fat, honey, yogurt to smooth for 1-2minutes on medium speed. Divide the dough in half. Working with half at a time, roll dough on a lightly floured surface to a thickness of 1/8inch. Cut out cookies into small (3inch or as desired) circle cookie cutter. Place cookies about 1/2inch apart on the prepared baking sheets. Let it sit on cookie sheet for 3-4minutes and then transfer to the cooling racks. Cool completely. In a bowl combine vanilla yogurt, lemon juice in a small bowl and stir. Spread on the cooled cookies with yogurt. Arrange fruit on top as desired and serve. Can use frozen cookie dough / personalise the dough as per the taste. Can even use cream cheese/whipped cream spread if desired. Posted on August 12, 2014, in Dessert, International, Kids recipes and tagged Chitras healthy kitchen, Cookie pizza, drchdietfood, Fruit pizza, Honey recipes, Mini fruit pizza, prakruthi honey, prakruthi honey bangalore, Sugar free cookies. Bookmark the permalink. 23 Comments. Thanx Malar for your lovely feedback as always. …. I like to make something similar was well. The kids like to call it a mini fruit pizza! I usually use a cream cheese and yogurt mixture spread on top. These look tasty. Oh my gosh that is so adorable! Love it! Yes dear…crunchy as well due to cookies..